It seems unfair, but there are some people out there who seem to have the trust of their customers, no matter how many times they let them down. And other, completely decent, honorable grids can’t seem to get any respect. Part of the problem is that many honest, reliable, hard-working people don’t like to toot their own horn. It makes them feel like car salesmen. They don’t like to be sold to, and they don’t want to be doing the same to others. Plus, they don’t want to put down other people or get into mud-slinging matches. It seems like either you avoid marketing, and not get any customers, or do marketing and become the kind of person you hate the most. Is business success really worth selling your soul for? Fortunately, there’s a happy medium. You don’t have to sell your soul to be good at marketing. In fact, you probably notice the bad kind of marketing most often because it’s the bad experiences that stick with you, and you don’t notice the good kind of marketing because you just take it for granted. Next time, pay attention. How do the companies you admire market themselves? In the OpenSim space, good examples to look at are Kitely and DigiWorldz. You can’t market your way out of being evil. You can try, for a short time at least, but eventually people will catch on to you. Plus, you won’t be able to keep your existing customers or get any referrals, and you’ll have to do more and more of the evil, lying kind of marketing to make up for it, eventually painting yourself into a little corner of evil. Don’t even start. Instead, keep your promises. Let your customers, business partners, and other community members know about your plans well in advance, and then follow through with your plans. Put your customers’ needs first. Don’t compromise your values for short-term gain. Be a good member of the community and support other grids and service providers. Be nice to your former customers and not just because then they’ll come back, or, at least, will recommend you to others, but because it’s the right thing to do. Make sure that anyone who handles customer support or public relations is extremely nice and patient. That doesn’t mean that you have to give everything away. Just provide a reasonable service, for a reasonable price, in a decent and honorable way and your customers will stick with you. And if they do go away and try some freebie fly-by-night grid, they’ll be happy to come back again after they find out what that was like — and they’ll tell everyone they know. In fact, be happy to encourage your customers to visit your competitors. The more they see what the other guys are really offering, the better they’ll think of you. And if you’re scared to let them visit your competitors, or see competitors’ ads, that’s a good time to ask yourself if you’re doing as good a job as you think you are. Remember that you want your competitors to succeed. If they do well, it improves the OpenSim community as a whole, bringing more variety of content and people to the platform. That helps everyone — including you. So do help out other grid owners. Do help newcomers launch grids. Here’s an example. Back in 2014, when OSgrid was having its server issues, 3rd Rock Grid‘s Terry Ford led a fundraising campaign to help it out. And when Ford left 3rd Rock the following year to start his own grid and hosting company, DigiWorldz, he continued to help his former grid with their technical issues. Now, you could argue that helping out a non-profit grid is bad for a commercial grid, because the non-profit will always undercut it on price. 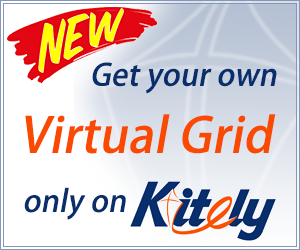 Plus, OSgrid is one of the largest grids out there. If it stayed down, all those people would have to find new grids to live on. But a good person would help, anyway. Even if it doesn’t make immediate financial sense. But, in the long term, I think it actually was a big net positive. I’m sure he didn’t do it because it was part of some marketing strategy to build up his brand prior to launch. It looks like he’s just that kind of person. And, as a result, DigiWorldz was one of the most successful grids of the year when it launched. 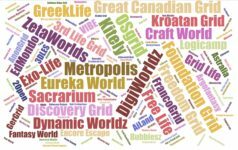 Plus, this year, many commercial grids have been going to DigiWorldz to get their hosting there, including Genesis Metaverse, KEA Nation and Baller Grid, and, most recently, Sinful Grid. 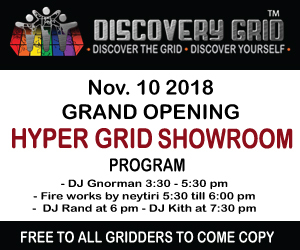 Would those grids have gone with DigiWorldz hosting, knowing that DigiWorldz was running its own commercial grid, if Ford didn’t already have a reputation for helping other grids? In fact, Ford has even offered help to AviWorlds, which, at one point, was running its own commercial grid hosting company. By being nice when others were piling on, Ford set himself apart — and AviWorlds was even briefly hosted by DigiWorldz earlier this year. Switching to a new vendor is always risky. There’s the money commitment, and the commitment in time and effort as well. How is a customer going to make that leap? Say, I’m someone looking to switch from Second Life to OpenSim. I’m worried about stability and performance, about customer support, and about losing everything I’ve built if something goes wrong. The traditional solution is to offer guarantees. A money-back guarantee on hosting fees if, after a month, a customer doesn’t like the grid. Or even a free one-week or one-month hosting offer to try out the service. OAR and IAR exports are extremely valuable to creators. Kitely, for example, offers filtered OAR exports, so that a creator can export everything that they’ve made themselves, or that they bought with the “export” permission enabled. That means that creators can build knowing that if they want to, they can move everything to their own, home-based mini-grid, or to almost any other grid in OpenSim. It seems counter-intuitive at first, but making it easy for customers to leave actually makes it easier for them to sign up in the first place. If they see someone leaving, and see that it’s easy, and that people are treated well when they decide to leave, it lowers the risk of signing up. There’s a lot of companies out there that try to make it as difficult as possible for their customers to leave. Word gets around. If customers are leaving at a high rate, trying to lock them in will only accelerate your company’s demise. Instead, look at the reasons for why they are leaving and focus your efforts on changing things. So you’re doing all of the things I mentioned above, and your business is still not going well? Before deciding that maybe you should try being evil instead, ask yourself if your potential customers are actually aware of what you’re doing. It’s evil to take credit for what other people do. But its totally and completely fine to take credit for your own hard work. Make sure that there’s someone on your team who’s tasked with monitoring everything that goes well. And also everything that goes badly that you’ve responded to. If you don’t have the a dedicated person to do it, allocate a certain number a hours a eek of your own time. Don’t skimp. This is an important thing. If you don’t track your successes, you will literally forget about them. The things that stick in your mind are usually the things that go horribly. And when you look back at your history, all you’re remember is a list of disasters. Also keep track of anything cool that your customers or partners have done. Don’t take credit for these things, unless you actually helped them in some ways, but do keep track of it. Post the news on your website, your login screen, on signs in your grid’s welcome area, and in in-world and email newsletters. Include pictures, links, and videos when available. Keeping your existing customers is much more cost efficient than losing them and having to replace them with a new one. So let your customers know that you are actively working on improving your platform, on solving problems, and are a good member of the broader community. And don’t forget to acknowledge all the great things that your customers are doing. Your customers should be proud to say they do business with you, instead of being embarrassed about it. Plus, referrals from existing customers are one of the best ways there is to build your business. New customers arrive with friends already in place who they can reach out to for advice. This is where you reach out to people who don’t know about your company, who have heard bad things about your company in the past, or who know about your company and are thinking of becoming customers but haven’t yet made the decision to join up. Website: Post all announcements in an easy-to-find place. Include all your news, your customer accomplishments, your positive reviews, news articles about you, new photos and videos, and links to relevant things you share on social media. Facebook: Many of your potential customers use Facebook, and enjoy following discussions on that platform. Make sure that you have a dedicated company page, post regularly, and address comments and questions promptly. Google Plus: In addition to having your own company page on Google Plus and posting copies of all your announcements there, also participate in general-interest Google Plus groups, such as OpenSim Virtual. Twitter: Tweet links to your website posts and social media links, as well as status updates if there are any problems or issues. You can set up a free IFTTT service to do this automatically, to make sure you don’t accidentally miss anything. Bloggers: Send press releases to us and to other news sites about the biggest events and announcements. These could be long, formal press releases with quotes and pictures and everything, or it could just be a note telling us what’s going on with a link to a post, or it could even be a brief story suggestion. Advertising doesn’t have to cost a lot of money, and can do a lot to help establish your brand. Start out with a free ad on Hypergrid Business. 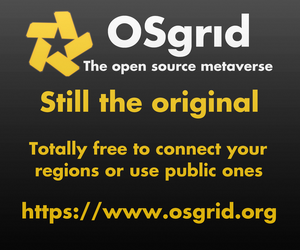 We’re happy to run ads for competing blogs, for commercial grids, for closed grids, for content creators — for anyone who’s offering something useful for the OpenSim community. To get better placement for the ad, make it fresh and timely, with a great offer and attractive graphics. If you offer a free land deal, you should let us know, as well. More than 500 people have visited that page since I put it up in February, so even if you’re only offering a free home or parcel, make sure you’re on the list. And yes, we list closed grids as well. Also, if your ad is attractive to people who are not yet in OpenSim, that’s a very big plus. 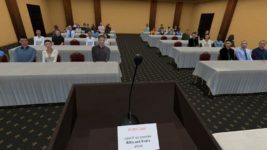 The goal is to grow the OpenSim community by exposing your products and services to people who may not have heard of OpenSim before but are coming here for the virtual reality coverage. So I’m going to put those ads first. Once you have your ad created, you can also share it on social media. Be very careful about using social media channels, however, to avoid spamming. Only post ads that actually have something new and valuable to offer. Don’t just run the same ad for your region rentals over and over and over again. Instead, pick your timing. And try to post ads that are only softly promotional, like an ad for a big event on your grid, or for a free new class that everyone is welcome to attend. 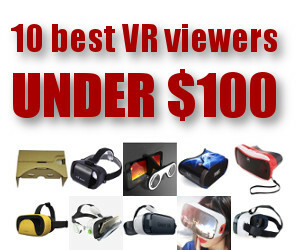 You can also trade in-world or website ads with your competitors. Remember those old “banner link networks” from the early days of the Internet? Webmasters would trade link ads with one another, helping their readers find interesting new content. A good type of ad to share with your competitors is an event ad. If you have a big event on your grid, putting up an ad on your competitors’ grids will help bring in visitors. And then you can do the same for them. 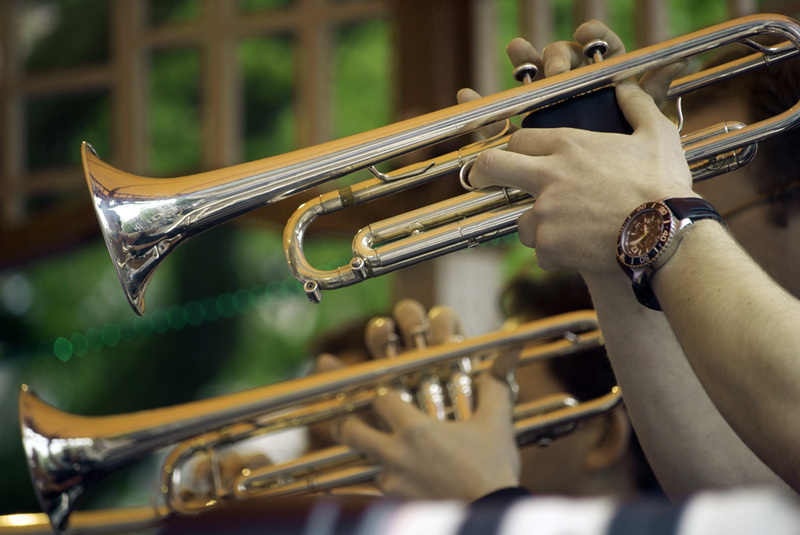 By expanding the event opportunities available to your residents, you will make them happier. Making them happier is much, much more valuable for you than potentially losing them to another grid. Happy customers stay longer, use more of your services, and refer their friends to you. Giving them more things to do, more places to explore benefits them — and, in the end, benefits you. Plus, it creates a more vibrant, engaged community for all the grids that you link with, making you guys, as a group, a more attractive place to be. Get the ball rolling by reaching out to other grid owners, and volunteering to run ads for their events. It’s not going to hurt you, and it’s going to help your residents. And if the other grids then reciprocate, that’s just icing on the cake. If you don’t require reciprocation, but do it just to be nice, other grids are more likely to step up and join out. Once they do, kick it up another notch by promoting their events in your social media channels. If you’re ready to spend money, I hear that buying Facebook ads that show up for the friends of the people who are your company’s followers is the biggest bang you can get for your buck. 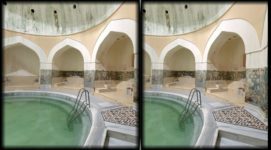 And if you have an attractive deal for Second Life residents, check if any relevant Second Life blogs would be willing to run your ad. This is a tricky one to get your mind around, since it involves a paradigm shift. But if you can do it, you’ll be a lot more successful in everything you do. The traditional way of looking at sales and marketing is that you’re getting people to give you money in return for something that they don’t really want or need. In this way of thinking, the better your are at tricking people, the more money you make. You can probably think of lots of examples of companies who do this, since it’s pretty egregious when it happens. But it’s actually a bad long-term strategy. The companies that are able to succeed with it are few and far between, and those that last usually shape up to some degree or another, or, at the very least, donate their ill-gotten billions to, say, help cure malaria or cancer. Instead, think of sales and marketing from the point of view of the customer. 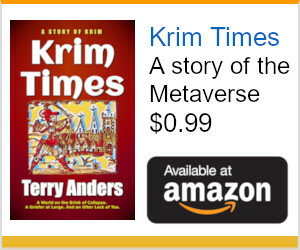 The customer has an unmet need. They want to make friends, or have lower-cost land, or have a nice new outfit to wear to an event. You can meet that need, but the customer doesn’t know it. They don’t know that you offer the particular product or service that they want, or they knew but forgot. If you don’t do any marketing, you’re hurting that potential customer because they won’t be able to find your service, and will instead having to settle for something else that’s not as good. They’ll buy a different dress, that’s not in the color they want, because they didn’t know that you sold the one they wanted. They’ll pay more than they need to for land, or they’ll get less support than they really want, or they’ll have to settle in some other way. By not marketing to them, you are making their life a little worse. So put yourself in your customer’s shoes. Unless it’s shoes that they need, in which case, put yourself in your customer’s bare feet. Where is the customer? Where are they most likely to see your ad? When are they most likely to pay attention to? What words or pictures will let your customer know that here is something that’s exactly what they’re looking for? Once you can start to think of marketing from the customer’s point of view, you will be making the world a little bit better, and you’ll be doing marketing that you can be proud of. And that means that your customers will be able to trust your marketing — and will help cement your reputation as a trustworthy company.